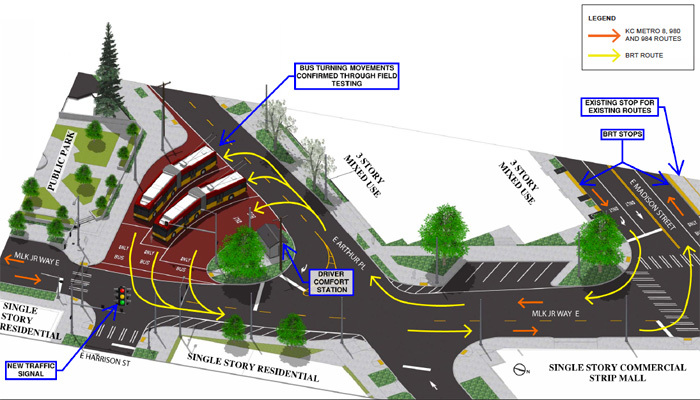 SDOT expects to have its designs for the long-awaited Madison Bus Rapid Transit project at 90 percent by the end of the first quarter of 2019. Construction of bus platforms and other infrastructure along Madison Street for the new RapidRide G line is slated to start early next year. The Madison BRT project is being designed to provide quick bus transit along Madison Street, from First Street to Martin Luther King Jr. Way, and will include 10 station areas and 20 directional platforms. Between First and Eighth avenues, and again between 15th and 17th avenues, the buses on the line would use shared business access/transit lanes. Between Sixth and 15th avenues, the route would split off into transit-only lanes. From 17th Avenue to Martin Luther King Jr Way, the buses would merge into general-purpose lanes. The transportation department expects more than half of the $121 million Madison BRT project to be covered by federal funding, with a $60 million request in to the Federal Transit Administration through its Small Starts grant program. Funding through the FTA has been stalled, however, and part of that is due to the need to have a fleet option identified to meet Madison’s steep grade. The city had engaged Winnipeg-based New Flyer about creating 13 60-foot articulated electric trolleybuses for the RapidRide G line for about two years. But New Flyer ended up unable to meet the task of creating such a bus that could handle Madison’s hills, which hit a 10 percent grade up Spring Street. Other electric trolley vendors were contacted, but none showed interest in taking on the order, said Alex Kiheri, RapidRide expansion lead at King County Metro. The current market for battery-electric buses also proved challenging, Kiheri said, from both a timeline for delivering such vehicles and the need for more buses due to the charge range, meaning more layover and storage space. Josh Shippy, project manager for SDOT’s Capital Projects and Roadway Structures Division, tells MPT the transportation department has now decided to go with a fleet of diesel-hybrid coach buses. The project had required 1.2 miles of overhead contact system (OCS) wire, plus 174 new and 86 replacement OCS poles, to accommodate the electric trolleybuses. SDOT published a Determination of Non-Significance for the Madison BRT project, taking public comment early last year. Shippy said the transportation department is reevaluating its environmental review of the project due to the fleet change. “There will be no significant impacts or changes,” he added. Metro has a goal of reaching a zero-emissions fleet by 2040, so electric buses on Madison could be re-explored in the future, Kiheri said. Switching from electric trolleybuses to a fleet of diesel-hybrid buses is expected to provide some savings with infrastructure, Shippy said. Discussions with the FTA late last year about funding for Madison BRT were positive, Shippy said, and a decision could be made by the end of the second quarter of this year. While there is no Plan B, he said, there are ideas about alternate construction plans should federal funding not come through. If everything falls into place, the 90-percent design will be realized by the end of the first quarter of 2019, at which point there will be more community outreach. However, that outreach will be more informative rather than seeking design feedback as occurred when SDOT previewed its 30- and 60-percent designs. If construction is able to start in late Q1 2020, the 24-month timeline for completion would set the launch of the RapidRide G line for early 2022. A contractor should be selected by late 2019 or early 2020, Shippy said. The RapidRide G line will end in Madison Valley, with buses turning around at MLK Jr. Way East and East Arthur Place, next to Julia Lee’s Park. While a number of Madison Park residents fought to keep the Madison BRT project from extending to where Madison Street ends at 43rd Avenue East, others are concerned about their transit options once the RapidRide G line starts. Kiheri said Metro monitors all routes and evaluates performance, but there are currently no plans for potentially expanding the RapidRide G line in the future, even now that overhead infrastructure will not be needed. Madison Park is primarily served by Metro Route 11. Metro will seek community feedback closer to the launch of RapidRide G to determine if any changes to the route may be both prudent and financially feasible, Kiheri said. Several station platforms around MLK Jr. Way will serve various other bus routes. RapidRide communications and public engagement manager Robyn Austin said an educational campaign will likely take place 12-18 months prior to the launch of the G line.